Friday June 23rd 1893 I went with Will this morning for a ride. we were out to Hartsocks and on around past Marys for butter. I got us some dinner and I wrote letters to Vene, Lizzie Duncan, & May. In the evening I wrote to Mattie Fletcher. Mr Mrs Rich called in the evening. Saturday June 24th 1893 I rode over home with Will for some things I wanted. I hurried through with some sweeping and baking before noon. Aunt Linda came in just as dinner was ready. Sunday June 25th 1893 I was busy about the work all the forenoon. It was very late when we got up. Ott and Fanny went over home and we went after taking a ride Fanny was sick all afternoon and did not get home till time to go to bed. We came home before supper. 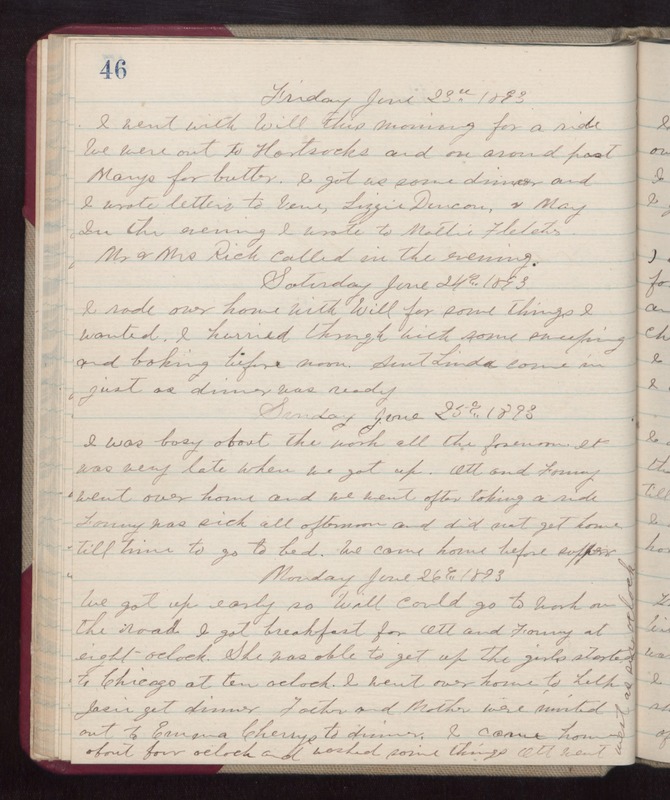 Monday June 26th 1893 We got up early so Will could go to work on the road. I got breakfast for Ott and Fanny at eight oclock. She was able to get up the girls started to Chicago at ten oclock. I went over home to help Josie get dinner. Father and Mother were invited out to Emma Cherrys to dinner. I came home about four oclock and washed some things. Ott went west at six oclock.